Sephra commercial chocolate fountains are the highest quality chocolate fountains in the world. 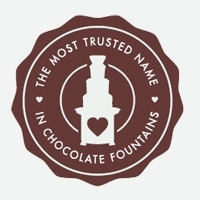 Unsurpassed in quality, reliability and ease of use, our commercial chocolate fountain customers generate thousands of dollars and increase guest satisfaction immensely. Commercial Chocolate Fountains 23" and taller come with Free Ground Shipping and 20 lbs of your choice of chocolate. Talk to one of our knowledgeable sales staff about owning your own Commercial Chocolate Fountain for your business.